Richard E. Grant seems as delightfully loopy in person as his character Jack Hock in Can You Ever Forgive Me? because he keeps spilling dirt on previous iterations of the film’s cast. The BBC reports that Grant told a live audience at an Advertising Week Europe event in London that Moore was fired from the movie because she wanted to wear a fat suit and fake nose to play Lee Israel, to which the writer and then-director Nicole Holofcener reportedly said, “You’re not going to do that,” Grant recalls. Moore has previously said she was fired from the movie for “creative differences” between her and Holofcener. 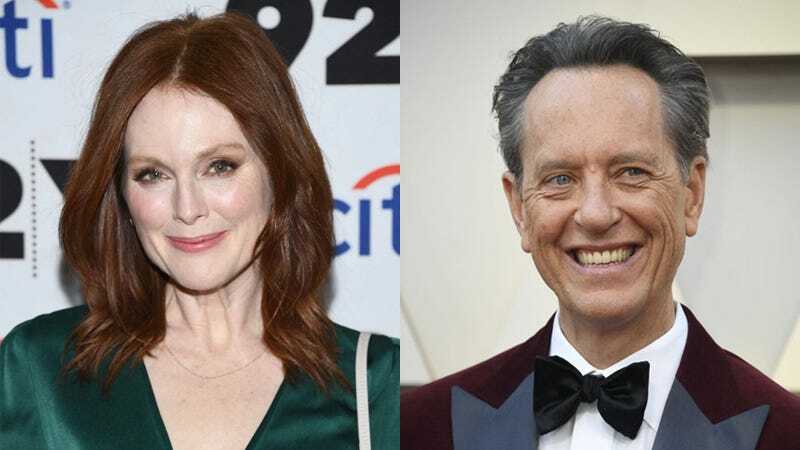 Now, I adore Julianne Moore (besides her movies, I think often of this Billy on the Street segment in which she has to recite tearful monologues to strangers in Times Square, which is perhaps too good for the show), but fat suits in films should be killed entirely, and wearing a fake nose to play a Jew screams of lite anti-Semitic caricature. Yikes, all around. Yikes. This has nothing to do with this blog, but I’d be doing a disservice to readers if I didn’t mention it: Grant also reportedly told the audience that he still has some of the costumes he wore when he played Clifford in Spice World. What a fun little live talk, eh? Richard E. Grant, please keep talking and never stop talking!